A brand New High Quality Lap Seam Folder For Most Flat Bed Sewing Machines . Fits many Industrial Sewing machines: Singer, Juki, Consew, Brother, Tacsew, Sailrite, Mitsubishi, etc. 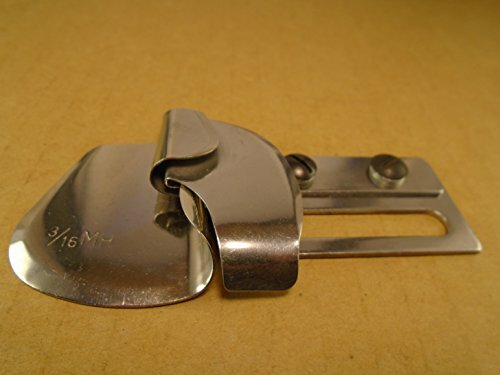 Fits many Domestic Sewing machines: Singer, Juki, Brother, Janome, Babylock, Kenmore, etc. Lap seam folder for most flat bed double needle lockstitch or chainstitch machines ,It attaches to the 2 screw holes next to the needle plate. This folder is used to connect the arms to the shirt body for heavy material. - 1/4 MH : suitable for Medium fabric . - 1/4 M : for light fabrics . 3/16S : for very light fabrics like nylon rip-stop or light apparel applications. NGOSEW CoverStitch Machine Binder, Semi-Fold Binding Attachment For Flatbed Machines # 1-1/8" - 3/8"
NGOSEW DOUBLE FOLD CLEAN FINISH HEMMING FOLDER ATTACHMENT FOR SEWING MACHINES HEMMER # 3/8"